CentrEd at ExCeL venue has 29 training rooms for 20 to 400 delegates, a private entrance with a dedicated reception area, dockside balcony access, coffee lounges with unlimited tea and coffee, waterfront self-service restaurant, Internet stations and business services, air conditioning - controllable from each room and complimentary Wi-Fi. "The geometric adjustment allowed us to remove any distortion as a result of the projector not being square to the screen. It was extremely intuitive to use." "With training and learning, we believe offering the right environment is key. We will be able to provide delegates with a one-of-a kind space within London. 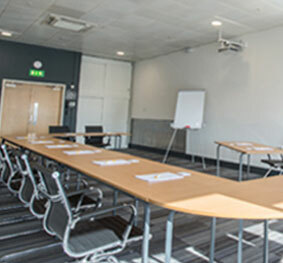 CentrEd at ExCeL has all the right ingredients to deliver a complete meeting experience." "The image quality from both the EH515T and the ultra short throw projectors are great and, being so bright, they handle the light from our long windows well." Задача: As part of a £1.5m major refurbishment project, CentrEd at ExCeL wanted to create a state-of-the-art training and meeting facility with 29 very bright, completely flexible spaces that can accommodate meetings of 20 people or major conferences. Решение: The venue installed EH320USTi projectors in each meeting space with two EH515T for larger events and PA systems across all rooms. Most people know of ExCeL for the huge exhibitions and events held there, but it also has conference, training and meeting facilities. 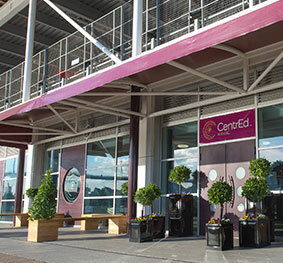 With the ambition of becoming the number one choice for any type of event, it embarked on a £1.5m major refurbishment project and the launch of CentrEd at ExCeL - a state-of-the-art training and meeting facility. delegates, each with built-in audio visual facilities. The training rooms all have windows along their length with panoramic waterside views across London. Although stunning, this creates a challenge for the projection equipment due to ambient light, particularly for the summer months. The venue wanted to create completely flexible spaces that could be used by 20 guests or an audience of 400. So, the equipment installed needed to be able to be accommodate small meetings and large conferences. The centre also wanted to offer the latest interactive technology with smart projectors that encourage collaboration and allow trainers or conference organisers to open, present and work on documents at the screen. 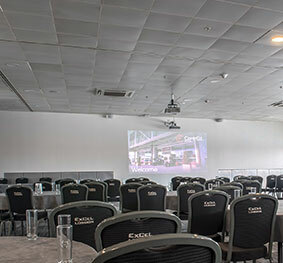 CentrEd at ExCeL installed EH320USTi projectors in each meeting space with two EH515T for larger events and PA systems across all rooms. At 4,000 lumens the EH320USTi is one of the brightest ultra-short throw projectors on the market making it perfect for these bright conference rooms. Its Full HD resolution and ultra-short throw lens create a huge vivid picture without any shadows cast from the presenter. It can project a 100 inch image (diagonal) from just 55cm from the screen. The bright 5,500-lumen EH515T projectors were installed with Optoma electric screens towards the middle of the room on existing ceiling mountings. The mounts can be rotated to project a 200” image at either end of the room – ideal for the large events. These mounts were unfortunately not centrally positioned in front of the screen. This is where the projector’s built-in geometric adjustment feature came into its own. The geometric adjustment allows venues to individually adjust each corner of the image to create a perfectly square image. This is ideal for uneven walls or where a projector placement is awkward and needs to be installed at an angle. The EH515T includes HDBaseT functionality which only allows data to be sent over a much greater distance than HDMI but can also carry HD video, audio, ethernet and control on a single cable. This significantly cuts down the number of cables needed for a typical business installation. Both the EH320USTi and EH515T projectors have a range of input options, including two HDMI inputs and two VGA inputs, making switching between Blu-ray player, computer or other sources simply the push of a button. They also have networking capabilities that make it easy to manage the projectors remotely via RJ45. Compatible Crestron RoomView® software can be used to power on/off, monitor, manage and control up to 250 projectors at the same time from any computer. This allows IT technicians to monitor the projectors remotely and avoids wasting lamp hours by leaving them running all night. CentrEd - the new meeting and training facility linked to the award-winning ExCeL venue – was officially launched in April 2016. Narendra said: “Getting the AV equipment right was crucial for our new facility. Conference organisers can simply connect their source device to the equipment and everything works seamlessly. The new meeting and training facility linked to the award-winning ExCeL venue includes 29 training rooms for 20 to 400 delegates, a private entrance with a dedicated reception area, dockside balcony access, coffee lounges with unlimited tea and coffee, waterfront self-service restaurant, Internet stations and business services, air conditioning - controllable from each room and complimentary Wi-Fi.